UPDATE: The Positioning, Navigation, and Timing Solutions conference has been postponed until May 21 due to the partial federal government shutdown. 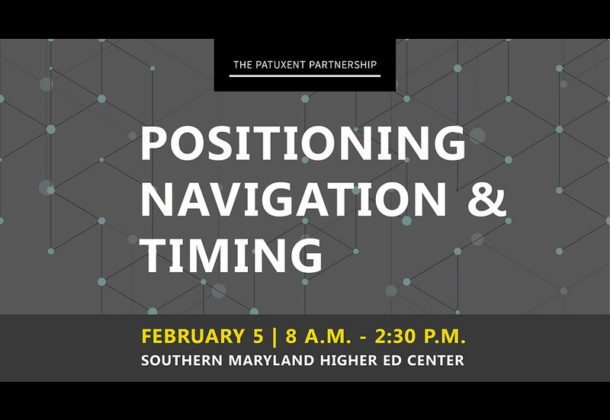 The Patuxent Partnership will be hosting a conference on matters related to Positioning, Navigation, and Timing in GPS-denied environments — locations where GPS is not allowed for various reasons. The conference is set for Tuesday, Feb. 5, 2019, from 8 am to 2:30 pm at the Southern Maryland Higher Education Center at 44219 Airport Road in California, MD. The conference will include expert speakers and panelists from government, industry, and academia to address the topic. The agenda starts at 7:30 am with check-in, coffee, and exhibits. The welcome remarks will be given by Bonnie Green, executive director of The Patuxent Partnership. The morning keynote will be delivered by Dr. Chris Ekstrom, deputy oceanographer and navigator of the Navy. Panel 1 will begin at 9 am, followed by a coffee break. Panel 2, Positioning and Navigation Technology, will begin at 10:30 am. Lunch and networking are set for 11:45 to 12:45 pm, then Panel 3, Timing & Communication Technology, starts at 12:45 pm. After the event, a reception will be held at the Taphouse on Route 235 starting at 4:30 pm. Registration for the event is $50 for TPP members, $90 for non-members, and includes coffee breaks and lunch. Government employees and active duty military members can attend for free, and pay $15 if they choose to have lunch. TPP does not provide refunds for canceled registrations, but does welcome substitutions. If inclement weather causes the facility to be closed on the day of the program, TPP will refund your registration fee. Acquisition workforce attendees can earn six CL points.